The teenaged Astrid Lindgren (Alba August) leads a carefree life with her family in rural Sweden. Eager to break free from her strict religious upbringing, she accepts an internship at a local newspaper where she attracts the attention of its married editor, Blomberg (Henrik Rafaelsen). When Astrid becomes pregnant, she is forced to leave her childhood home for Copenhagen to secretly give birth to a son, Lasse, whom she reluctantly leaves with a foster mother, Marie (Trine Dyrholm). Astrid goes into self-imposed exile in Stockholm, refusing Blomberg's offer of marriage but saving up her paltry salary for visits to see her son. When Marie falls ill, Astrid uses her imagination and flair for storytelling to reconnect with her child. In spite of her struggles, she emerges with a newfound courage that will form the foundation of a vast and beloved body of work. "Pippi Longstocking has sometimes been called an icon of feminist girl-power. 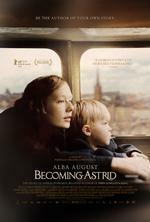 If "Becoming Astrid' makes anything clear, it's that the character's creator was something of one herself." "This film about an exemplary woman, made by women, is as much a pleasure as it is a lesson." "Hansen's relaxed camera movements and fuzzy-soft compositions are quite beautiful, and the performances - including the superb Trine Dyrholm as the baby's Danish foster mother - are pitch-perfect." "Christensen portrays Lindgren as a born storyteller but delves into the vital time in her development when confounding expectation gave way to building her own narrative."